These wrenches are fantastic labor savers. If you have been thinking about adjusting your diesels valves on your own - this kit will save you time, frustration, and high shop labor costs. Now is the time to get your own pair. NOW WITH RUBBERIZED GRIP HANDLES. 100 percent made in the U.S. The wrench, pipe for the handle, and even the rubberized handle material are ALL made in the good ole U.S.A!!! Works on the following chassis with diesel engines from 1961 -1985: 110, 115, 116, 123 and 126 300SD. The 201 190D and all other Mercedes diesels from 1986 and on had self adjusting hydraulic lifters that do not need servicing. The lack of routine valve adjustments may just be the single most neglected maintenance item I see on diesels coming into my shop for the first time. Neglect here can cause low compression, hard cold starts, rough idle, excess smoke, reduced power and poor fuel economy. Valve adjustments should be done every 12,000 to 15,000 miles. 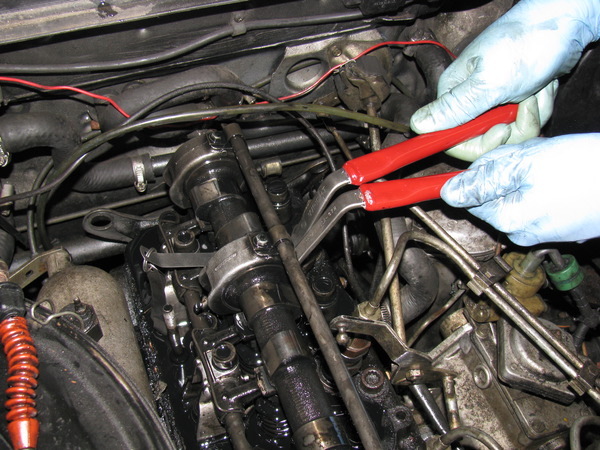 If you do not know the history of your engine, do a adjustment procedure NOW before anything else! I recommend you do not attempt the job without the proper special wrenches. Regular open end wrenches will not work. Detailed how to instructions are included with this wrench set, along with feeler gauges in the proper clearances. 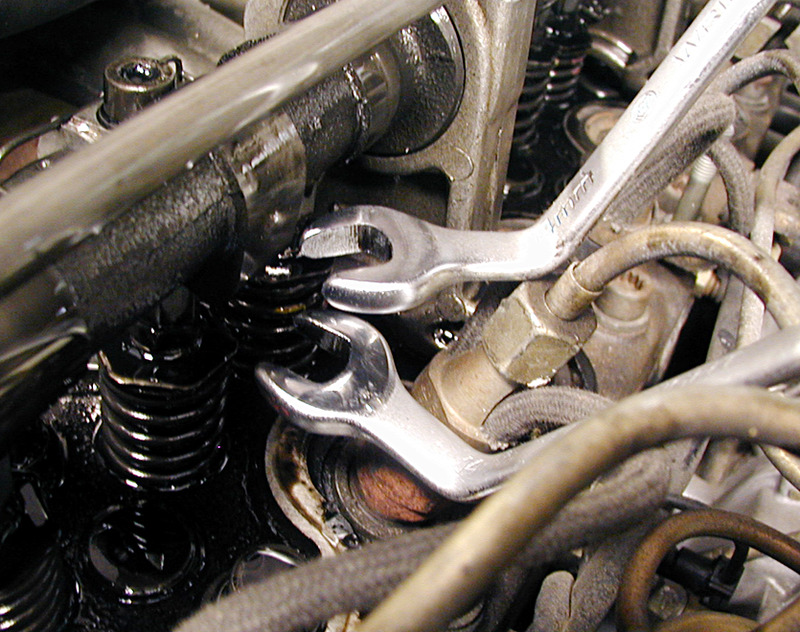 They wrenches will also be required if you plan to replace your valve guide seals. CONSTRUCTION: These are painstakingly made here in our own shop by hand. There is fabrication, welding and custom grinding that goes into making these wrenches the most popular Mercedes diesel valve tools made in the world. As of October 14, 2011 we are now shipping them with special tight fitting rubberized grip handles. Note: They no longer have red handles. Since they are hand made they will not look like Snap-On quality wrenches, but they do a better job that any factory wrench made. COMPARISON: Other than the handles, there are two main differences between my wrenches and the German Hazet set. The Hazet wrenches are thin but the heads are also very wide, which can makes it difficult to get the heads on the rear two valve nut sets for adjustment. Their heads are also straight with no offset so your options for alignment in tight places are limited. What I've done with my wrenches is to offset one wrench head to the right and offset the other wrench head to the left. This will allow you to use either wrench on the top or bottom nut to get them into really tight spaces. The wrenches are extremely well balanced in your hands and the comfort I have designed into them greatly reduces fatigue. SPECIAL NOTE: Some have asked about the third wrench which is recommended for working on difficult valves. The purpose of the third wrench is to hold the hex cap of the valve spring from rotating while you are adjusting the two nuts for valve clearance. From my experience I have found that this third wrench can be rather cumbersome to use and is not really needed in most applications. Sometimes you'll have a stubborn valve that will want to spin while you are trying to turn the nuts. When this happens, you will need a way to keep the valve spring cap from rotating. I found another way to do this without the third wrench and it is simple to use. My holding method doesn't require a special tool and it is explained completely in the instructions which are included with these wrenches. My valve wrench kit comes with a set of feeler gauges, complete instruction booklet with layout guides, and a set of nitrile gloves. This is a must have kit for any older diesel owner. ALSO NEEDED: You will need to replace the valve cover gasket when you adjust your valves. Be sure and order a gasket or gasket set of 3 to have on hand for this job. To find these type valve cover gasket in the search box. Our wrenches flat out just work better than the competition! They fit in where the German wrenches won't and our wrenches won't leave you exhausted and spitting nails! Piicture below shows the older style before we started rubberizing the handles. Why Won't My Mercedes Diesel Valves Adjust Properly? Will This Old Diesel Be Able to Pass a Compression Test?